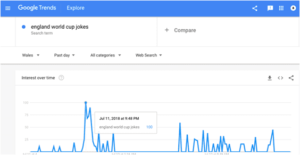 We regularly use a host of insight tools when planning our campaigns but this week, I wanted to use Google Trends to track the rise – and fall – of interest in the England football team. 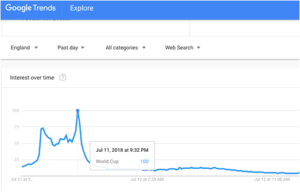 In the past 48 hours, interest in the World Cup came to an abrupt end for England fans. Meanwhile the Welsh, Scots and Northern Irish tried to lighten the mood as they searched for England memes and jokes after the final whistle was blown. And by the end of Thursday, Trump trumped Southgate. It really was all over for England fans when the final whistle blew on Wednesday night as ‘World Cup’ searches across England quickly died away along with any three lions’ hopes of repeating the glories of 1966. 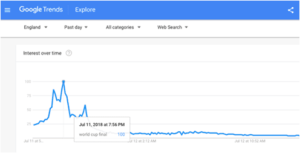 As you might have expected, supporters were in an optimistic mood as England led, with ‘World Cup Final’ searches peaking soon after half time. However it may well have tempted fate given what then happened. Some England fans may find some solace from the neighbourly concern shown across the border, as the Welsh (supported by the Scots and Northern Irish) quickly sought to find ways to ‘cheer up’ their fallen comrades as frantic searches for ‘England World Cup jokes’ and ‘England memes’ soon followed the final whistle and continued into the early hours of the morning. Thanks guys. They say fashion is fleeting and unfortunately it looks as if the waistcoat has become last season’s must have. ‘Waistcoat Wednesday’ quickly turned into ‘I Don’t Think So Thursday’ as searches for the ‘fashion’ garment reached an all time week low in England. On the other hand, in Scotland, interest in waistcoats actually grew at the end of the game… which could ease the worries of many retailers who now find themselves with more on their hands than John Virgo. The morning after, England was quick to get back into its usual morning routine as we checked what the weather was going to be like at 6am, had a quick read of the news and then looked to see what our commute was going to be like. While we might have found ourselves initially more interested in Donald Trump than Sir (well he would have been if England had won) Gareth Southgate, our priorities soon changed and our interest as a nation in Love Island (OMG Samira’s left I hear you cry) looks set to continue.